Home Categories Guitars - Ukes -Banjos Ukes-Banjos Makala Tenor Uke Package - with case and accessories! Makala Tenor Uke Package - with case and accessories! Kala Makala Series MKT Tenor Uke with case and tuner. The Kala Makala MK-T Tenor Ukulele offers a fresh approach to ukuleles. The MK-T has an Agathis body, along with a rosewood bridge. Sporting a 3 1/8” body depth and a 26 3/4" length, the MK-T pumps out a lot of sound, and delivers a warm tone. The mahogany neck features a rosewood fingerboard with 18 brass frets. 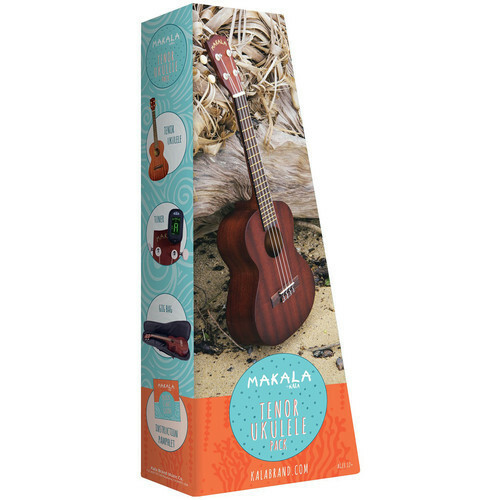 Guitar players will love the low action and ease of playability The Kala Makala MK-T is extremely affordable and a great way to get started on the ukulele.